This painting was one of those remaining in Eyre Crowe’s possession at his death, and was sold at Christie’s in London, at an auction of his remaining work on 18 March 1911, for £15 15s. Mr. Eyre Crowe’s efforts will reinstate him in public favour. He sends three pictures … the smallest is most highly finished. 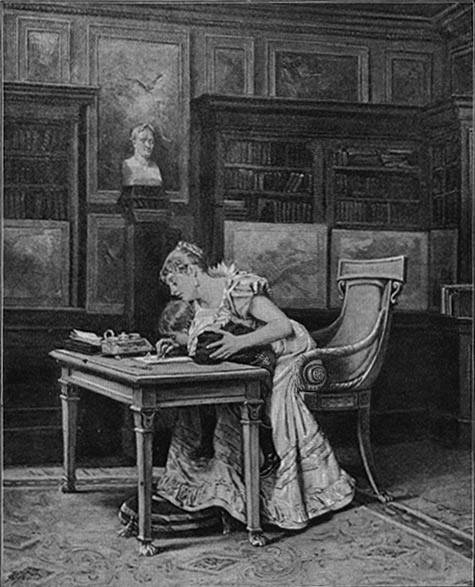 It is called Writing a Message to St Helena (388), an incident in the history of the Empress Marie Louise, who taught the little King of Rome to write letters to his imprisoned father. She sits at a writing table with the pretty, fair-haired child in her lap, and carefully guides his hand over the paper. The boy’s earnest expression and the empress’s attentive air are good points in a cabinet example more than usually finished. The scene is a library; there are pictures on the walls, and a laureated bust of Napoleon on a pedestal.